Yes, Christmas is almost upon us and as much as I would love to delay it a least another week I can't. I did get most of my work done since the last post. I changed the calendar (I know about time, it used to be stuck at June), I changed the flag to a Christmas themed one, the tree is decorated and the house smells like cookies. I am however nowhere near done, at least it feels that way. The tree was one of the things I really slacked on this year. It finally got decorated and it looks pretty. The tree is an artificial one, I can't have a live one because I'm allergic :( This one is nice it has glitter and pine cones and fake snow in it. Almost all of the ornaments on it are handmade. There are some clay and some painted. The majority are plastic canvas. There are even some cookies ones, the kind that smell like cinnamon and gingerbread. I try to avoid putting a lot of breakable ornaments on the tree because I'm afraid the cats will knock them off and break them. So that's my tree...all done. Then came the cookies. We have a tradition of baking a ton, and I do mean a ton, of cookies. I bake a least five different kinds of cookies a year. This year there's peanut butter kiss cookies, sugar cookies, thumb print cookies (these have different kinds of jellies in the middle), and rugelach (a cream cheese dough cookie with raisins and nuts and sugar in the middle.) I still have to cut out and decorate and bake the sugar cookies but the rest are all done and in boxes for Christmas day. 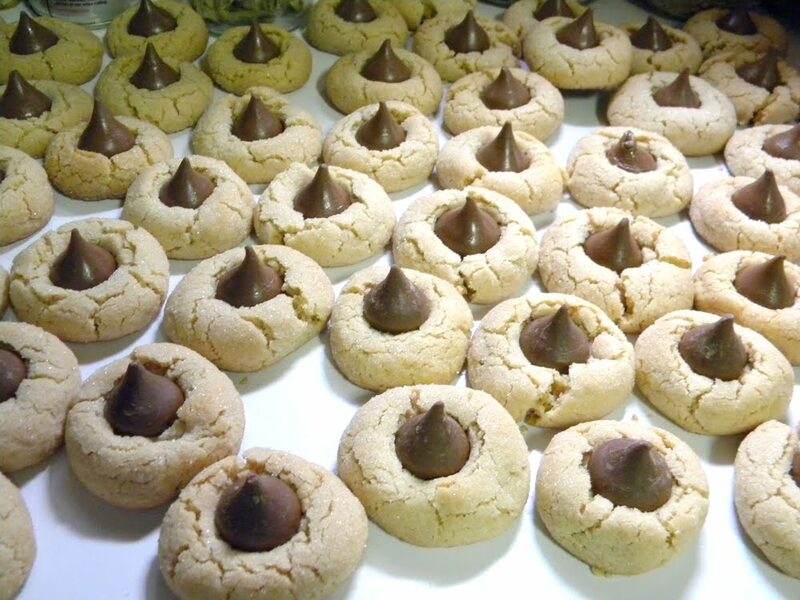 If you like peanut butter kiss cookies here's the easiest way to make them: Buy a package of peanut butter cookie mix (any kind will do, this year I used target brand.) Make the mix according to the package directions. Roll the dough into one inch balls and coat them with some sugar. Bake them in the oven at the package temperature 8-12 min or until the cookies look like they are cracking. Take them off the cookie sheet and gently push an unwrapped Hershey Kiss in the middle of the cookies. Allow them to cool until the chocolate kiss has hardened back up and enjoy. I still have wrapping to do and some more cleaning to do to get the house ready but other than that I think I'm almost done. It seems that as families grow and change so do traditions. I would be wrong to say that mine hasn't, but it didn't for many, many years. We have some traditions that we still follow and the ones that we don't. I would love to go back to doing. I moved fairly far away from my family and it is one of the few times we all can seem to get together is right around Christmas. Since I moved everyone comes here for the holidays, to exchange gifts and have a feast. This lead to doing away with some of the more special traditions that were there. "I awoke to a cold morning, not wanting to get out of my nice warm bed. I threw the covers back with one full swoop, so as not to be tempted with their warmth, and climbed out of bed. I threw on my favorite red sweater and black pants, and brushed my hair. I proceeded to put on my jingle bell earrings, that I was warned not to wear the day before, knowing full well that they would annoy my mother so much that by lunch time she would make me take them off. I had a big day ahead of me; it would be the first time I really got to help my grandmother cook our traditional Lithuanian Christmas Eve dinner. I could barley contain my joy at the idea. 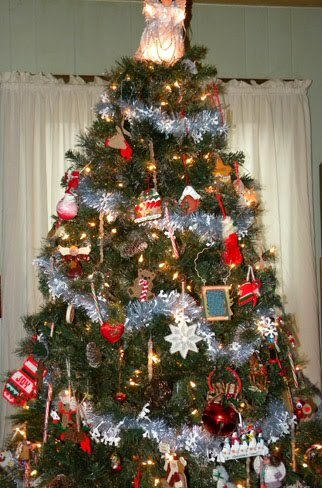 Christmas Eve by far was my most favorite day of the year, followed very closely, of course, by Christmas morning. When I opened the curtains to my room and saw that the ground had been covered with and fresh clean blanket of snow I just couldn’t contain myself anymore and ran out to the living room screaming “IT SNOWED”! My mother was already up and packing thing in bags that we needed to take to grandma’s with us. She suggested that I go get my boots and coat on so we could leave when she was done getting things together. Once I had all of my outer clothes on I helped my little sister put hers on too, anything really to help speed up the process of getting out of the house and getting to grandmas. Upon arrival to my grandmother’s house, you get bombarded with the smell of all the wonderful foods she has already started cooking in preparation for dinner. The pork chop broth for the beet borsht was already made. She immediately put me to work grating the beets and cutting up potatoes and mushrooms. Once the beets were grated we added them along with peppercorns and dried polish mushrooms to the pork chop broth. It needed to cook for a while before we added the smelt to it. We then took the majority of potatoes and put them in a pot of water to boil and make into mashed potatoes once they were done. The other potatoes and mushrooms got added to some butter in a cast iron skillet with some of my grandmother’s secret spices and some onion. We got the cream corn out and into a pot, the large cast iron skillet out and on the stove full of oil waiting to cook the haddock in it, and we opened the olives and pickles and put them out on the table. I got to set the table while we were waiting for everything to cook. The red and white porcelain dishes, silverware, napkins, special frosted Christmas glasses and shot glasses for the adults for the toast. The package of blessed wafer set in the middle of the table waiting for my grandmother to break it. Everyone slowly made their way into the kitchen. I added the smelts to the borscht, and floured the haddock so grandmother could fry it in the skillet till it was golden brown. We got out the slaw, egg nog, butter and milk out of the fridge, and started putting all the food on the table. Once the smelts were cooked in the borscht, bowls full of reddish purple borscht started to make their way to the table, and the fish was brought over on a plate covered with paper towels to collect any excess oils. I mashed the potatoes with butter, salt and milk, while my mother got the other potatoes and mushrooms into a bowl and the cream corn into a bowl too and put both on the table. With everyone seated at the table and all the food around us, grandmother poured the adults blackberry brandy in the shot glasses and egg nog for everyone else. She broke the blessed wafer and gave everyone a piece before she sat back down. I proceeded to say grace and everyone ate their wafer then toasted to a good and blessed Christmas. The food never seemed to stop flowing onto our plates. When everyone was done and full with as much as they could eat we went out into the living room to watch some TV while we waited for my grandmother to give us the okay to run up stairs to see what Santa had left for us at her house. It was usually a plastic candy cane filled with chocolate and a coloring book and crayons. I was exhausted. I never realized how much work my grandmother put into making all that food. Once we got our presents from Santa we were out the door and off to church for the 5pm Christmas Eve mass. After mass we would ride around and look at Christmas lights that people put out for decoration. Then home to put out cookies and tea for Santa and to bed. BED! I was so tired after such along day. I was asleep as soon as my head hit the pillow. This was many, many years ago. My grandmother is now in her nineties and lives in a nursing home because she has dementia. I am thankful that I was able to learn how to make this feast from her and that she taught me her secrets. I still carry on this tradition with my kids. I make the borscht and the fish and the majority of the meal. We do not break the wafer because I cannot find it anymore, but we do toast to a good Christmas. We go to church and drive around and look at all the beautiful lights. I hope that someday my kids will want to learn and carry on the tradition as well." Since the moving I unfortunately have not been doing this and it hurts to think about it. We do still go to church, the kids sing in the choir, and ride a round and look at lights. I just for some reason can't seem to find the time or means to make the meal. I have on average ten people over for Christmas and cooking two big meals back to back is just out of the question. My hope is to one year start this tradition again and hope that it is not to late for my kids to enjoy it.